the most common question about THEM, is what size should I get? Well, measure your foot and use the chart below! Now I am here to discuss with the small footed fellows who shard my concern, and share some insight to those large footed fellows as well. You medium just go enjoy the skates! I wear a size 7 and that’s generous enough that I have had to modify skates over the years to fit tighter. THEM smalls fit very close to a small Valo Light shell, but the major difference comes with the lacing! The very simple lacing that many have mocked feels like fingers gripping your foot down once tightened. I was skeptical, no lies. 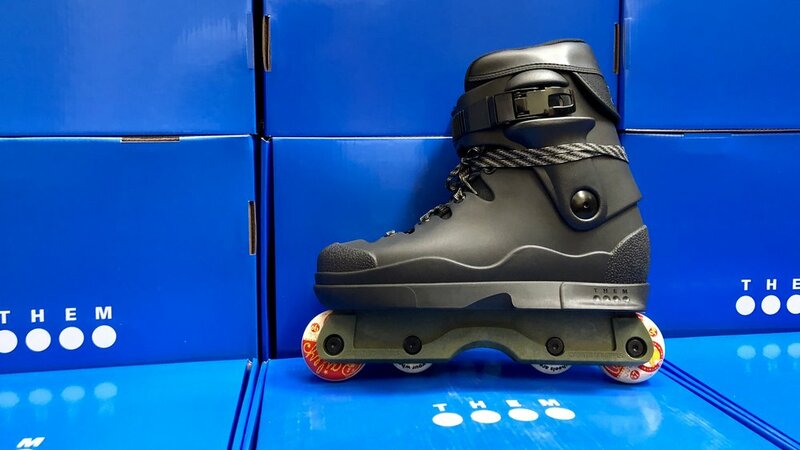 “How am I going to skate THEM, if they don’t fit?? ?” So I arrived at Jon Julio’s and quickly tried the small shell. There was room but not as much because the liner is thicker and the right places. After adding a second insole they fit perfect. Anyone who has skated the small shell valos, V13s, Roces, Cults, or USD and wants to try THEM out I’d say go for it. A more detailed review to come once I’ve had a few more sessions on THEM. Miguel Ramos is a size 13 and has also had to tinker with his skates over the years. Just on the opposite spectrum of my issues. He had a brilliant and simple idea that has been working for him. (Side note: we are glad to have him back on skates! Here’s to a quick recovery and more clips on his Instagram!) he unstitched the toe to his liners. I asked about stubbing and he said he hasn’t had any issues! So there you have it, feel free to ask any questions and I’ll try to update again soon with a more comprehensive review. You can also just try a thinner liner... can’t wait to see THEM set ups!